Airfare must be paid in full upon booking. Final Payment Due March 1st, 2017. Space is limited so act now! Travel Insurance is highly recommended and can be requested at time of deposit. Payment Plan Available. Hotels: Rome: The Donna Laura Palace Hotel is a luxury building recently renovated set in a nice area in the centre of Rome, few minutes away from Vatican City, the River Tiber and the Spanish Steps. 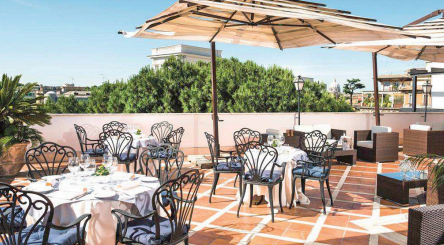 This hotel is the ideal place to start visiting the monumental treasures of the eternal city and the roof top garden is the perfect place to unwind after sightseeing. Sorrento: Grand Hotel Vesuvio where drinks and breakfast are served on the rooftop restaurant, with views of the bay and Mount Vesuvius. The hotel offers large swimming pools, gardens, extensive lemon and orange groves, wide lounges, solarium, free shuttle bus into town , restaurants, bars. Rooms feature air conditioning, wi fi access and satellite TV. Itinerary: Saturday May 06: Arrive Rome. Check-into hotel and welcome dinner in typical restaurant. Sunday May 07: Ancient Rome walking tour. Private coach for 4 hour visit of Coliseum, Roman Forum, Palatine hill and other monuments of Ancient Rome. Afternoon and dinner at leisure. Monday May 08: Vatican Museums visit. Transfer to the Vatican Museums for a 4 hour visit of the Vatican Museums including Sistine Chapel and St. Peter's Cathedral. Lunch, afternoon and dinner at leisure. Tuesday May 09: Sorrento, Pompeii and Mount Vesuvius. Travel to your accommodations in Sorrento with a visit the archaeological site of Pompeii with private guide. Proceed to Mt. Vesuvius for wine tasting lunch in local winery. Wednesday May 10: Excursion to Amalfi Coast. Full day excursion along the Amalfi Coast with stops in Positano and Amalfi. The tour is lead by private guide. Thursday May 11: Boat tour to the island of Capri. Transfer to Sorrento port to start your full day tour to the island of Capri. Public ferry ride to the island and full day private guide. Friday May 12: Day at leisure in Positano. Roundtrip private transfer to Positano to start a full day at leisure. Saturday May 13: Farewell Dinner Sunday May 14: Transfer to Naples airport and Depart for home. Newer Post Mis fotos de italia!